This blog post is dedicated to our New Jersey friend Gary B. who, whenever we went out with him and his wife to dinner and a movie, would get a bucket of buttered popcorn and a box of chocolate-covered raisins to eat—even if he already had a big meal. His habit of combining popcorn and Raisinets has influenced us, as we now like to eat something sweet with our salty snacks. We no longer live in the Garden State but still watch a matinee in the local theaters once in a while and eat popcorn and candy. On some Saturday evenings, we laze around the house and watch videos and also eat microwaved popcorn with a side of homemade chocolate raisin nut clusters. They are an amped-up version of Gary’s favorite movie theater treat. Our double-dating days with our friends may be over because of the distance now. But Gary can still enjoy this easy recipe with his family in their huge home theater. 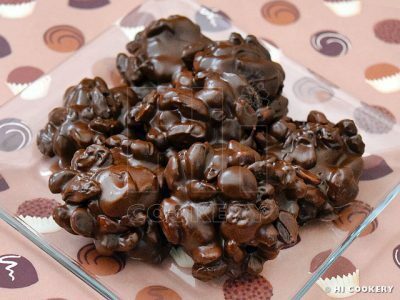 And we can all treat ourselves to chocolate raisin nut clusters on National Chocolate-Covered Raisins Day! Line a cookie pan with waxed paper. Set aside. 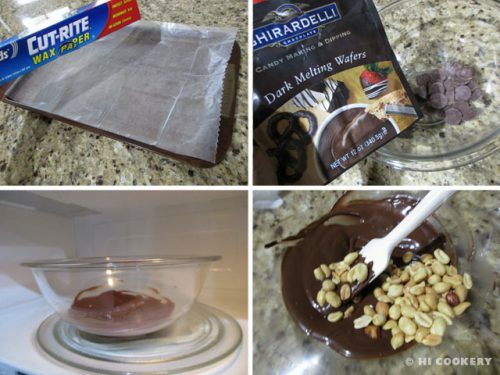 In a large bowl, melt the chocolate (over a double boiler or in the microwave according to the directions on the package). Stir until smooth. Add the peanuts. 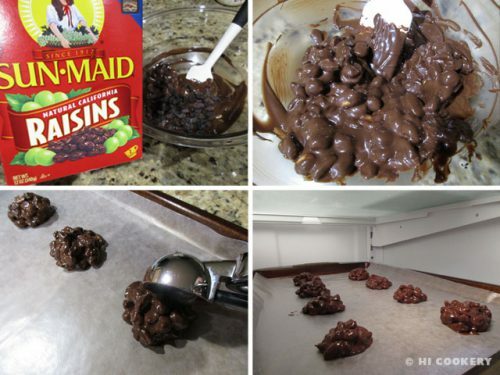 Stir in the raisins and coat everything well. Use a small scoop to drop a cluster on the prepared pan, leaving ample space between each candy. Refrigerate to set until firm. Peel the clusters from the waxed paper. Serve at room temperature. This is a very versatile recipe. Exchange the peanuts for pistachios, macadamias, cashews, etc. Use golden raisins or dried cranberries. Instead of dropping clusters on waxed paper, spoon them into mini cupcake or candy papers for an elegant presentation.